Bob Torbet led the May meeting with 15 in attendance. We had 1 guest beside the regulars. The minutes from the previous meeting were read and accepted along with the treasurers report. Jack updated the plans for the static display at the rest home in Bluffton on June 12th from 9:30 to 11:30 to be followed by a lunch at the depot. He also gave a rundown and tentative route for the June 26th tour from Bluffton to Bowling Green. This will be a one day tour with stops in Findlay on the way up and back. Jim mentioned the tour with the Tickin' T's to the Ohio Caverns with details to be included in this newsletter. Melvin told about his plans for an August 14th tour in the Piott Castles and Fort Recovery. Come to the July meeting for the in depth details. 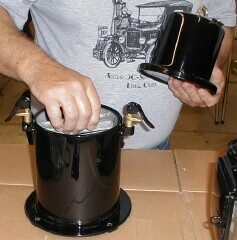 Coils were tested, a Maxwell carburetor demonstrated, a carbide generator shown, and treats enjoyed by all. 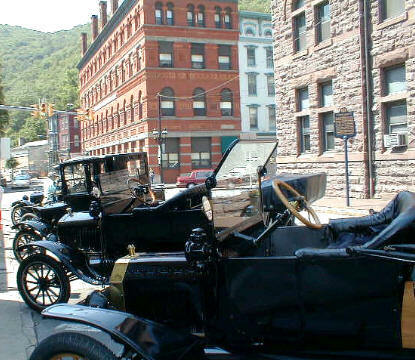 Model T's that were built previous to 1915 did not have electric lights. The magneto was too small to do any more that power the coils. The clasic marker lights and tail light were kerosene and the headlights were powered by a carbide generator that sat on the left running board beside the driver's door. Although some really clever methods of lighting the headlights form the driver's seat were developed over the years, the only sure fire way of lighting the lights was to climb out of the car, turn on the carbide generator, open the front lense of the headlight, and strike a match. Depending on the amount of carbide gas flowing at the point of ignition, the lights could slowly light and grow in intensity or there may be a small ball of fire leave the front of the light toward the driver. The parts of the carbide generator are simple in design. There is a bottom container for the carbide and a top container that contains the water. Carbide gas is produced by dripping water over carbide. As can be seen in the photograph to the right, the bottom container houses a basket for the carbide and basket above that for a drip trough. The speed of the dripping water over the carbide is controlled by an adjustment on top of the top section. 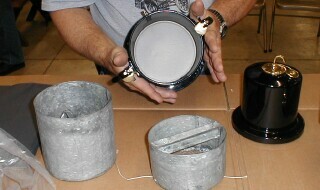 The top and bottom are sealed together to form an airtight fit. Tightening levers can be seen in the photograph to the left. Carbide does not create a large amout of pressure; but, it is still a substance that requires caution in its use. 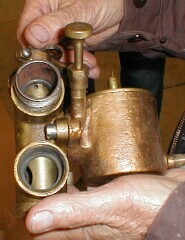 Rubber hoses and brass piping carry the carbide gas from the generator to the headlights. Many old car enthusiasts use bottled gas instead of carbide because of the mess and unreliability of carbide gas. This is an original carbide generator, not a replica. 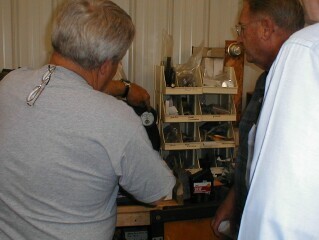 The handywork was performed in Bill's shop in Sidney. Leroy is a real artist when it comes to working with original parts. This is real show quality work. This is an every month occurance at club meetings. There are more coils in the world that need adjusting than there are automobiles that use them. 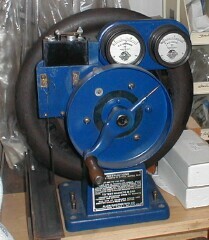 The original hand cranked magneto coil tester is the only way to set coils accurately. Both of the national Model T publications have gone into great depth about the importance of setting up coils on these devices. The important factor is the buildup and breakdown of magnetic fields in relation to the firing of the cylinders. replicated on a little spark box. To the right is the coil tester that we use. Once this thing is cranked with a coil in place, you can see the sparks jumping from the end of the needle opposite the handle crank and the ring (looks like a rear brake drum). Voltage is read and the points are adjusted accordingly. I have seen a few of these around in other shops, all of which do not perform at anywhere near the level of this unit. I think that the determining factor to keeping these units in top order is the cleanliness of their environment. I doubt that it hurts this unit to be used so much. It likely keeps the contacts clean with all of those coils being shoved in and pulled out. Date: Saturday, June 26 2004 WEATHER PERMITTING. We will follow North Main out of Findlay north through Van Buren to Rt 18, then east to Bushey Rd. Turning north on Bushey to Tank Farm Rd. West on Tank Farm Rd to Rock Ridge Rd. Rock Ridge Rd will take us to Cygnet. We will go west through Cygnet cross over to the west side of I-75 and go north on Rt 25 to Kramer Rd. East on Kramer Rd to County Home Rd. County Home Rd. will take us past the Wood County Museum and on to Snooks. Snooks is located just north of Route 6. We should be at Snooks by 11:00 - 11:30. There is a $4 admission per person/group rate. The Wood county museum should also be open to us if you care to stop there. We will return by reverse route. If you want upon returning to Russells you can cross over I-75 to Jeffery's and it may be possible to book a steam train ride with Dennis if he has steam up in the engine when we get back. This is an easy tour which basically parallels I-75 from Findlay to Bowling Green. 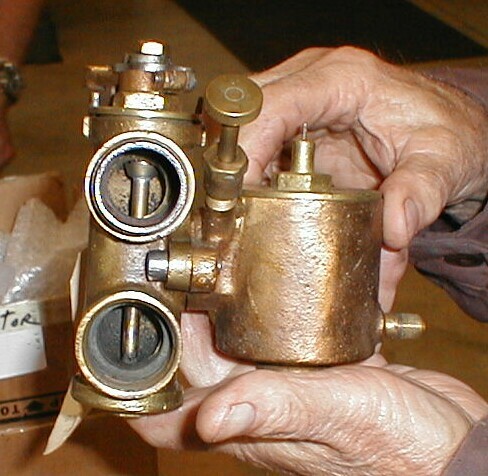 Here we have Dave Benny's Maxwell carburetor. The valve has been sticking and the thought is that the old cork has absorbed too much junk over the years and refuses to float properly. That little wire sticking out of the top should indicate the float level. There are two ways to participate in this tour. You can either start with the Tickin' T's at Plain City or you can join the group at the Ohio Caverns. 2. Continue west from Milford Center to Route 245. 3. Left on Route 245 thru North Louisburg, Middletown and Mingo. Look for and follow the red and white signs to OHIO Caverns. Arrive around 11 - 11:30 am. 4. Tour the caves and/or enjoy Ohio Caverns Park. Clean restrooms, gift shop, and club provided snacks. 5. 1:00 pm, Drive to Village of West Liberty via Route 245. Lunch at "Liberty Gathering Place" restaurant. 6. 2:30 - 4:00 pm - FREE TIME "Do your own thing"
7. Leave West Liberty at 4:00 pm via 287 to Middleburg, Ohio. 8. In Middleburg, turn right on County Rd #153. Drive east to Route 245. Turn right onto Route 245, then quickly, left turn onto Middleburg Rd and back to Plain City. ETA 5:30 -6:00 pm.